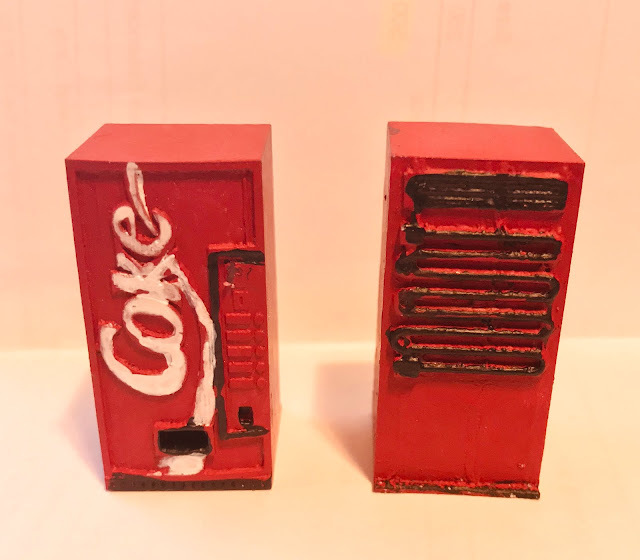 I finished painting a pair of 28mm Coke machines. As you can see, they look pretty sloppy up close. Jeff suggested using a miniature roller to paint the raised Coke logo, but I couldn't find such a tool. I also tried several kinds of white paint, and all of them were difficult to work with, forming ugly clumps. What is it about white model paint..? I'll probably do one more round of touch-ups on this project, but I think they're good enough to throw into the field now if needs be. I plan to use them as scenery for Villains & Vigilantes or Wasteland Warfare. What are you using for thinner? I agree, some paints just are miserable product: unholy lumpy crud. That stuff, I thin out as best as I can and apply multiple layers, hoping for the best. I'll tweeze out the lumps with a pin or tweezers or swear words, or a combination of those. My understanding is that the best white and yellow pigments tend to be highly toxic, which precludes their use in a number of ranges such as Citadel Colour. You end up using second or third rate pigments and often end up with thick, chalky and often translucent coats. It’s not quite the same technique, but with raised surfaces like that you can almost drybrush them with a stiff-bristled brush. Take all the liquid paint off the brush and drag the bristles across at a high angle. Most importantly though, recognize that at arms length these will look just fine, and even better on a tabletop. Have you tried looking for mini paint rollers at the hardware store?